Located at the heart of historic Arles and once the site of a Roman Forum, the Place du Forum has served as the town’s political and social center since ancient times. Today, the public square remains an atmospheric spot, clustered with restaurants and cafés, and buzzing with life both day and night. The Place du Forum has also earned a place in the limelight thanks to the iconic ‘Café la Nuit’, better known as ‘Café Van Gogh’, which stands on the square’s southeast corner. Famously immortalized in Van Gogh’s 1888 painting ‘Café Terrace at Night’, the café’s distinctive yellow façade and unmistakable lamp-lit terrace is an unmissable stop for art lovers following in the footsteps of Van Gogh. Place du Forum is located in the historic center of Arles, Provence. Visit the haunts of Vincent van Gogh and arresting Roman ruins on this full-day tour of Provence from Aix-en-Provence. Drive through the Alpilles mountains to St Rémy de Provence, known for its vibrant open-air market located within ancient Roman walls. Swing by St Paul de Mausole, a monastery that once treated van Gogh as a psychiatric patient (following the infamous ear incident). Then, in the UNESCO-listed town of Arles, gain insight into van Gogh’s life here, while seeing Roman ruins like the Arles Amphitheatre. Round-trip transport by comfortable minibus included. Experience Van Gogh’s vivid and picturesque Provence on this full-day tour from Marseille! 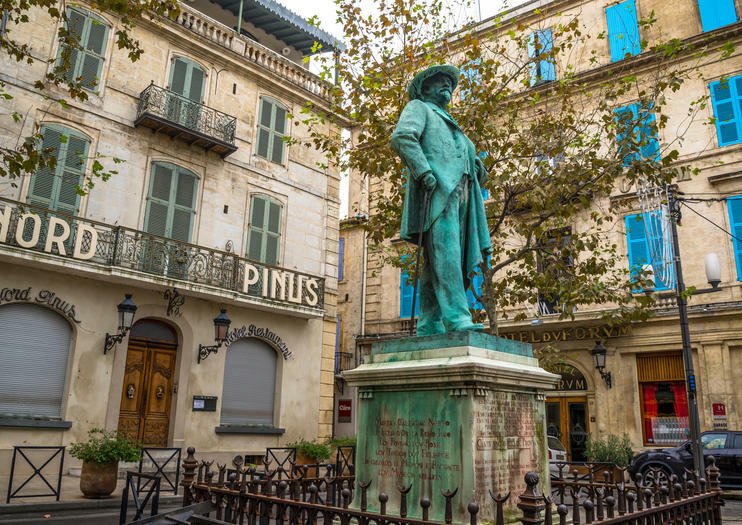 Journey to the seaside town of Arles – where Van Gogh fully realized his signature style – to visit key sites like the ancient Arles amphitheater, Saint-Trophime church and the setting of Le café de nuit. Continue to Saint-Rémy-de-Provence to see the triumphal arch and funeral monument, and to the hilltop village of Les Baux de Provence. Set out from Marseille for a day tour of Les Baux de Provence and Arles, an ancient city sporting some incredible Roman monuments. Your private excursion begins with an informative walking tour through Arles, taking in sights like the centuries-old Arles Amphitheatre and Café Van Gogh, which appears in its namesake's iconic painting, The Café Terrace. Then enjoy a leisurely afternoon in the medieval cliff-top village of Les Baux de Provence, exploring old ruins and cobbled streets.